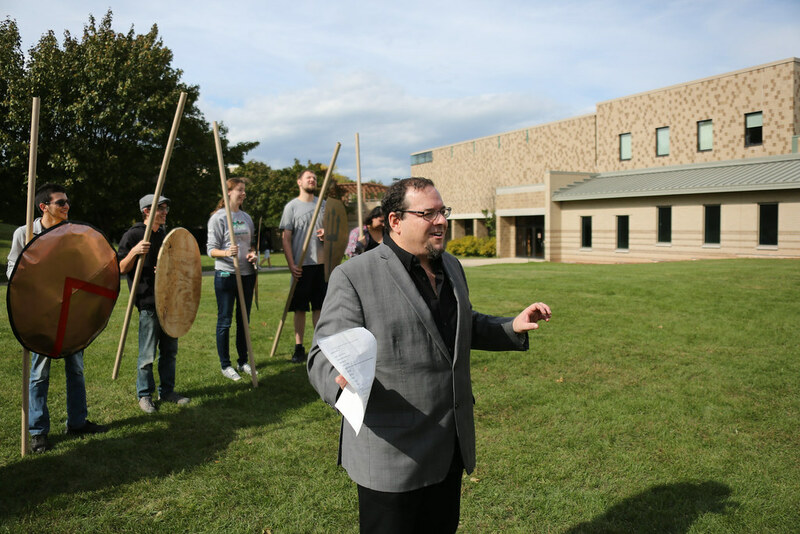 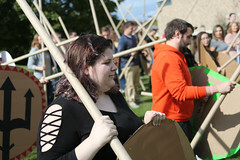 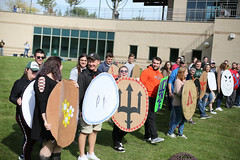 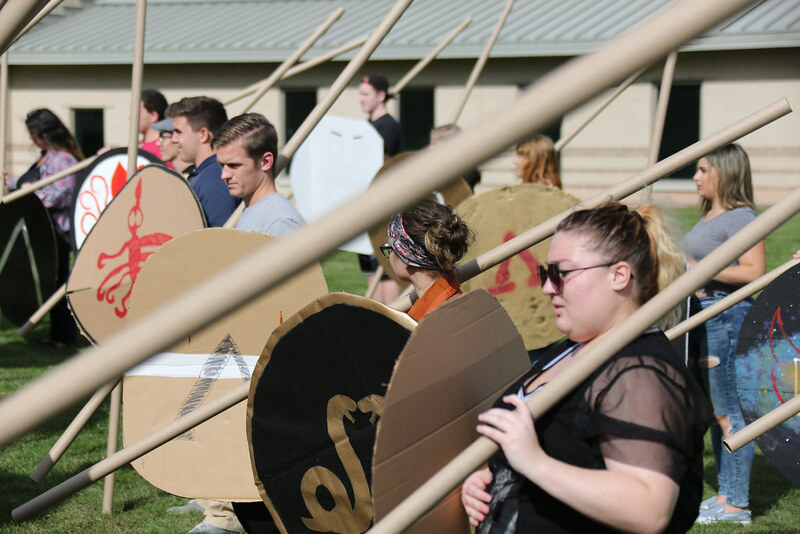 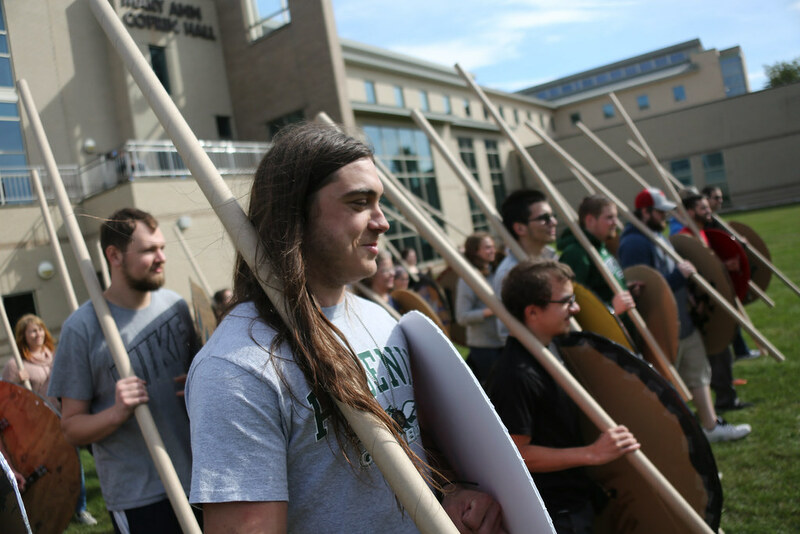 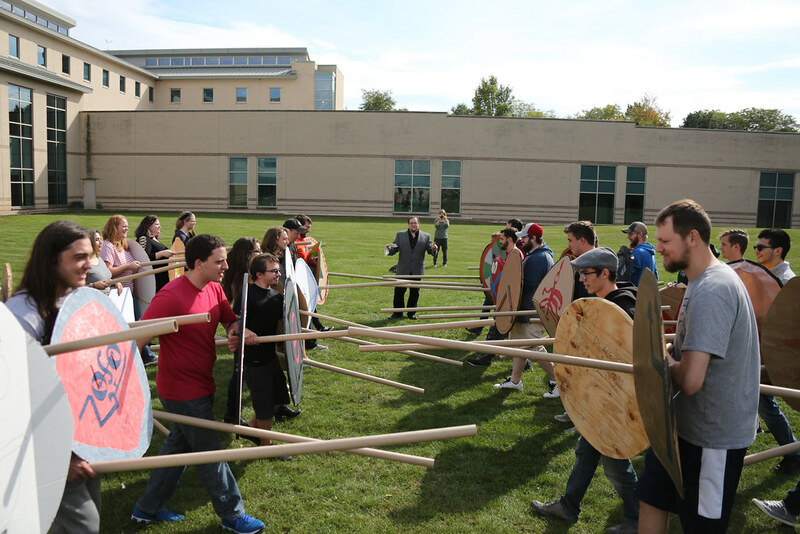 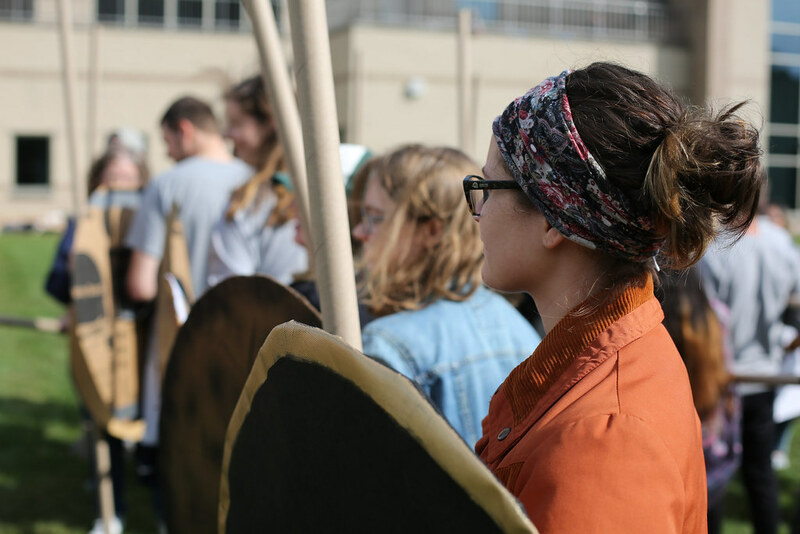 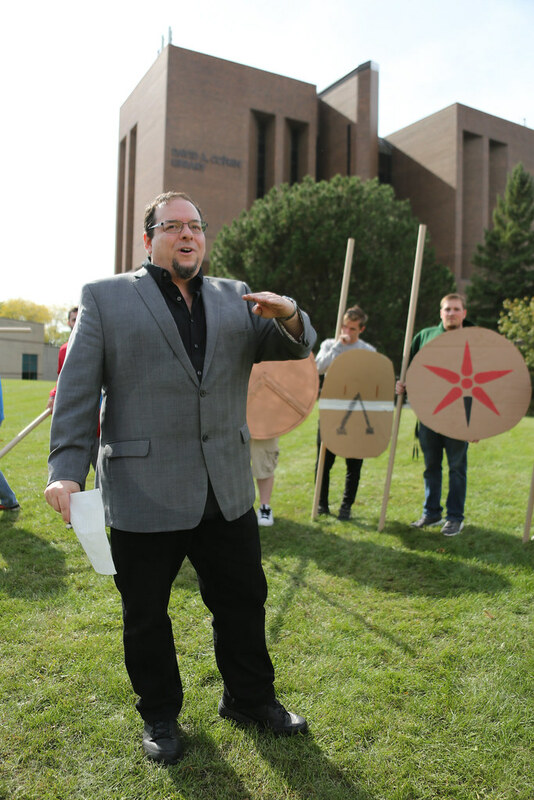 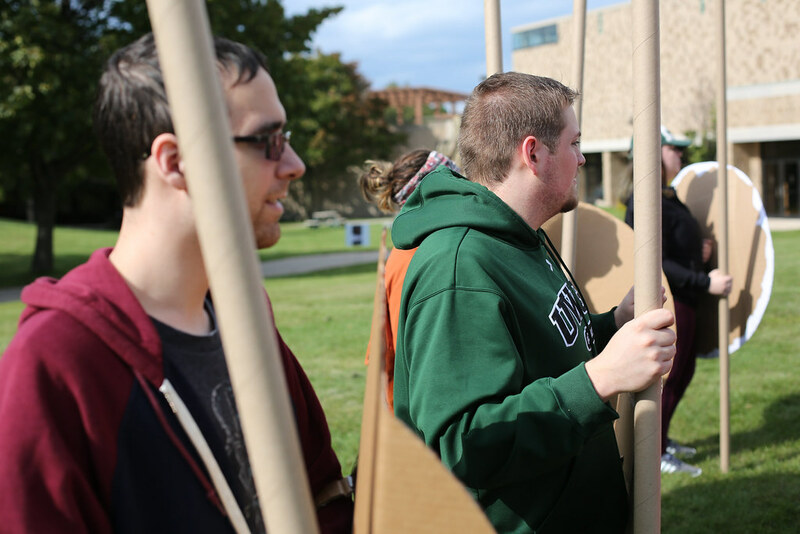 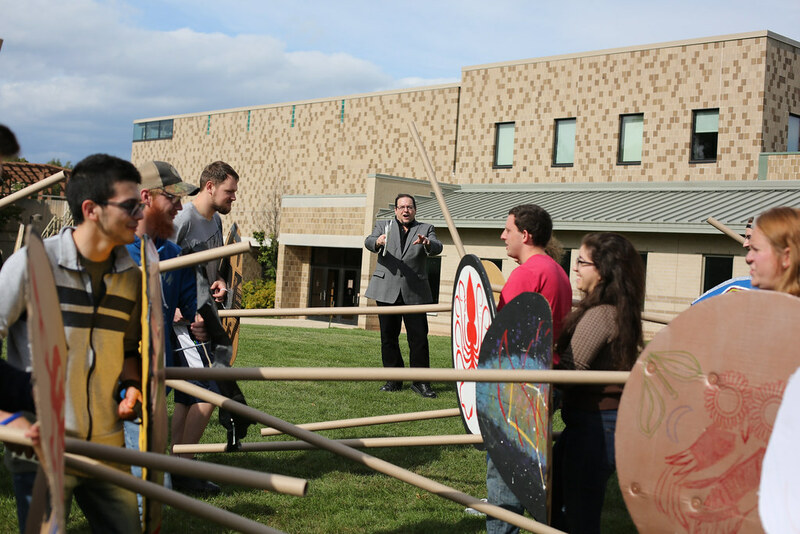 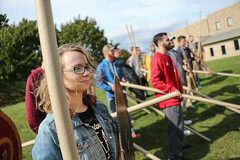 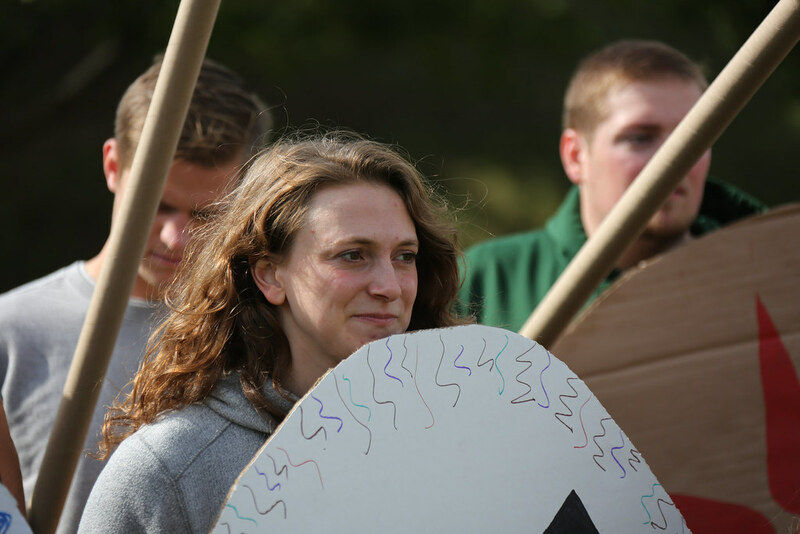 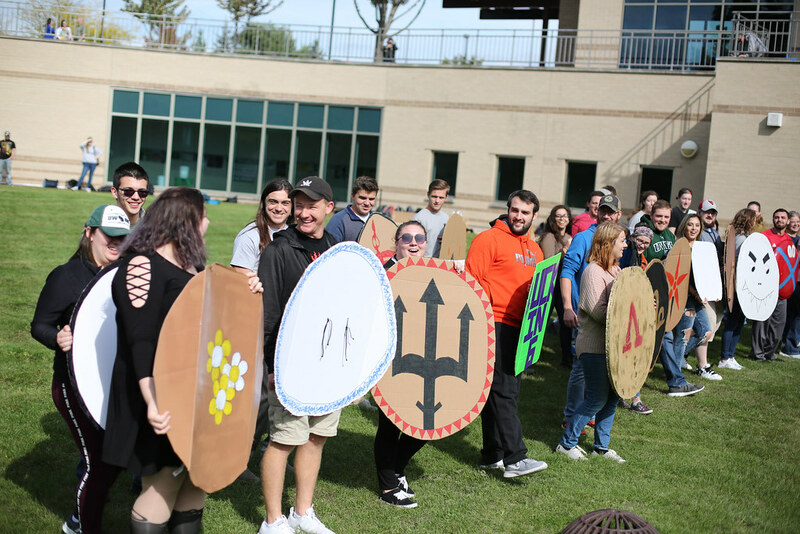 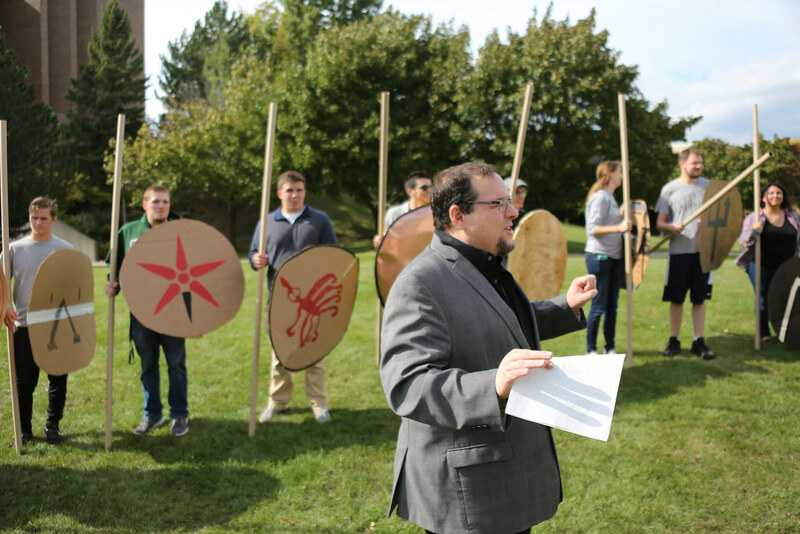 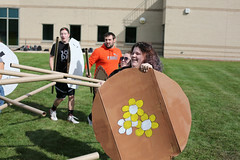 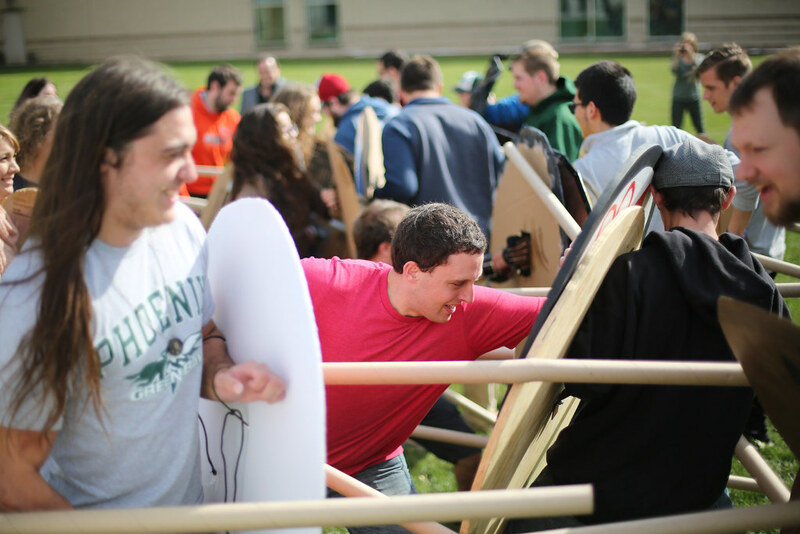 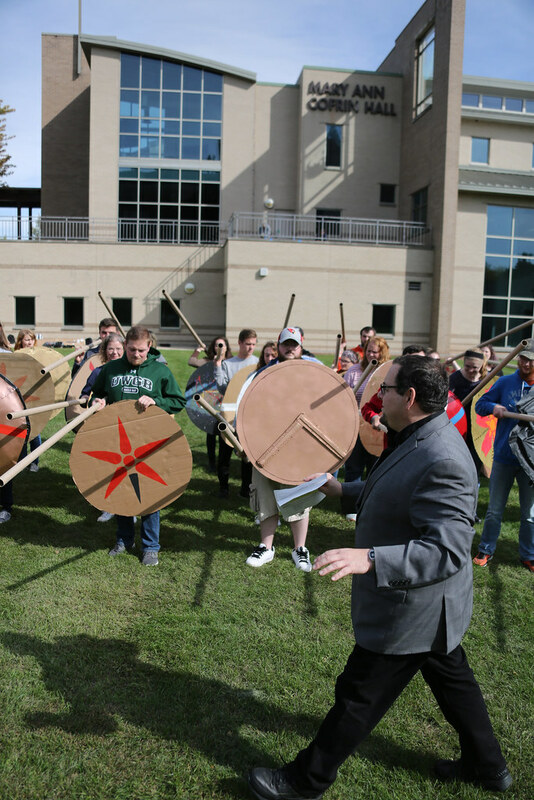 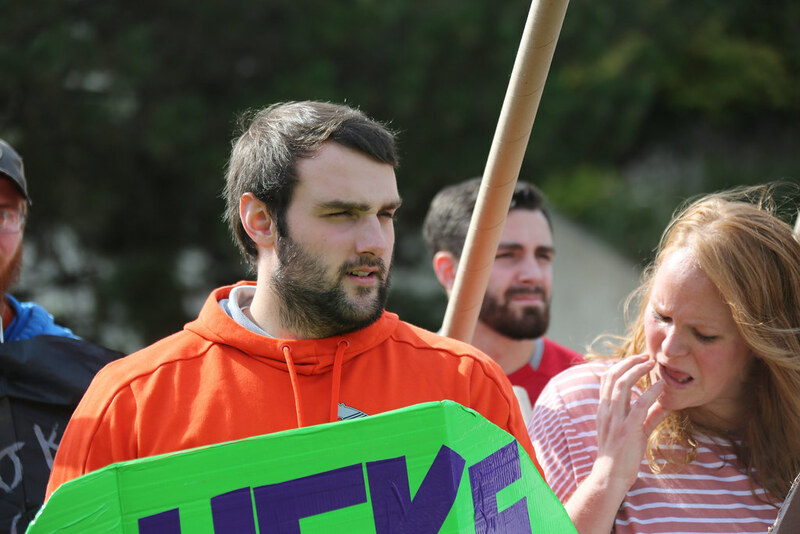 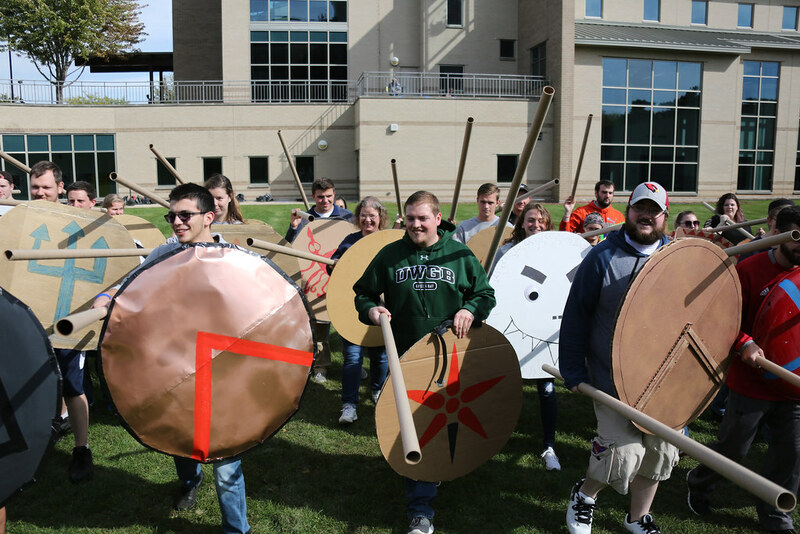 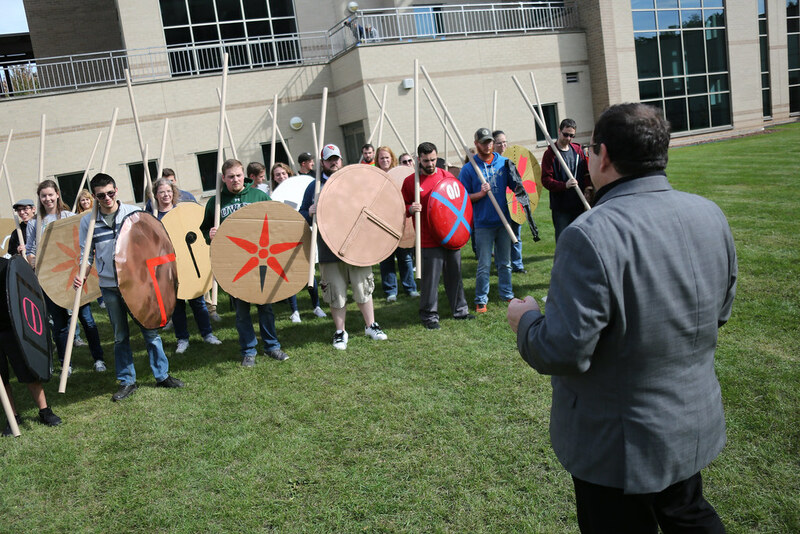 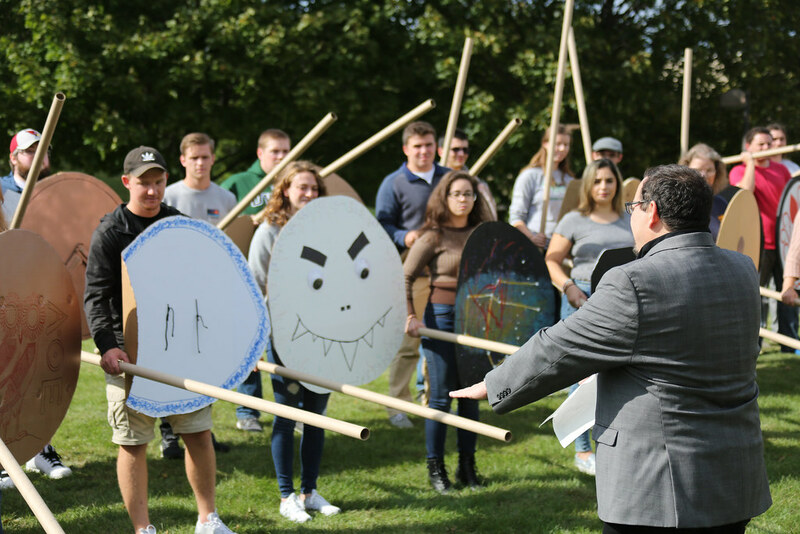 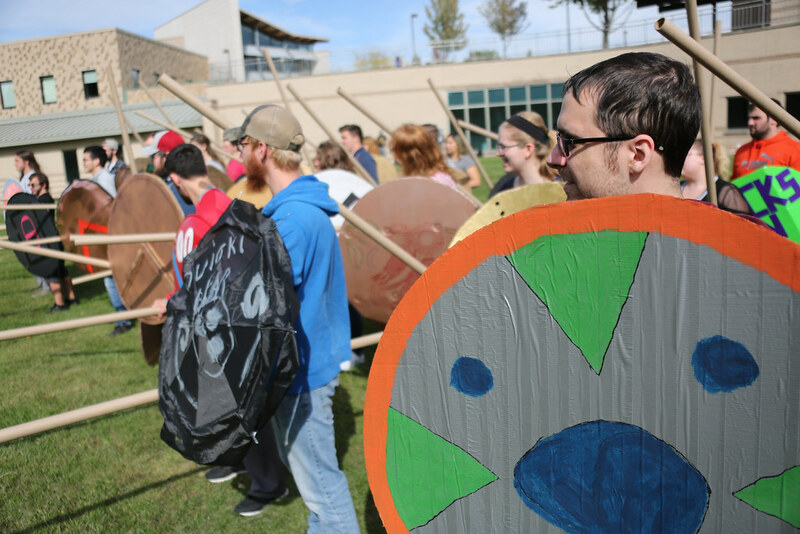 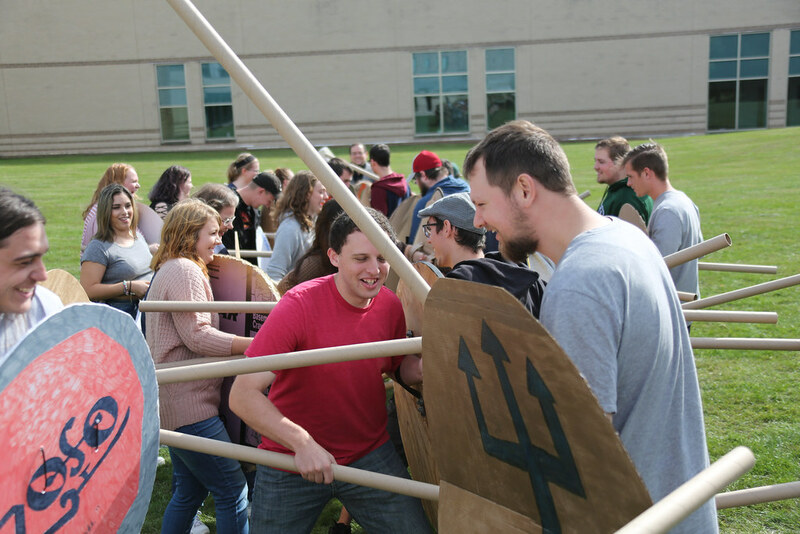 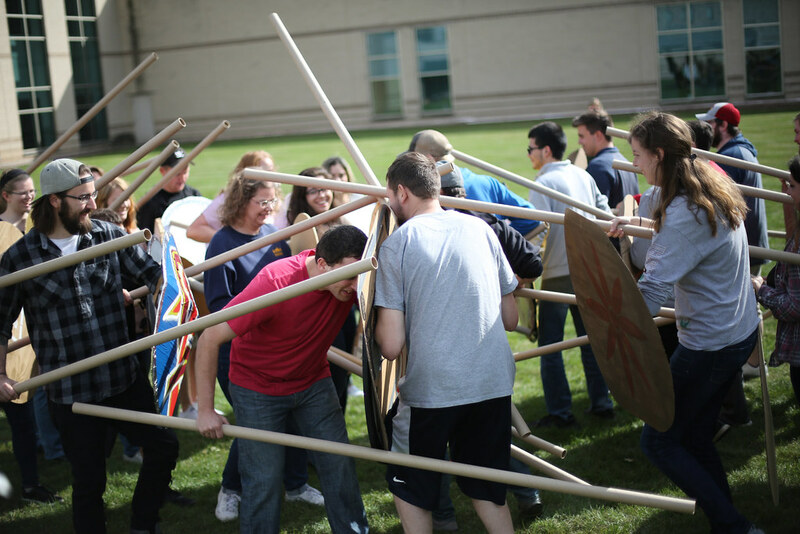 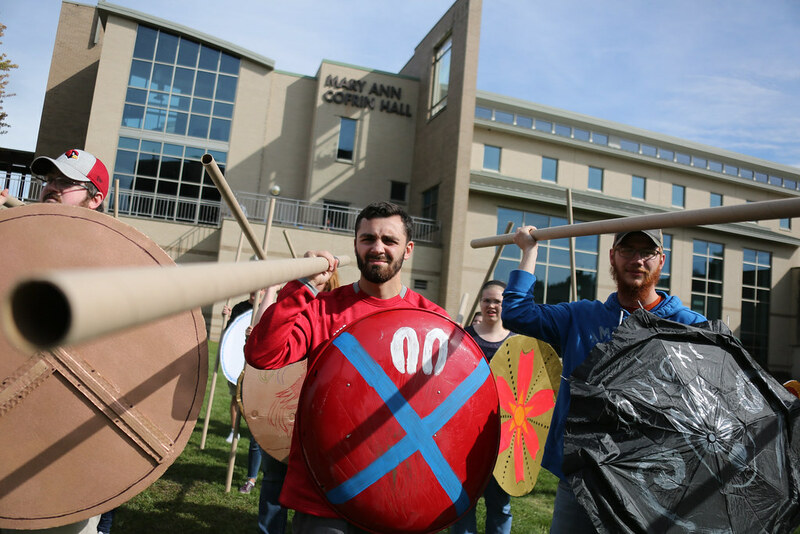 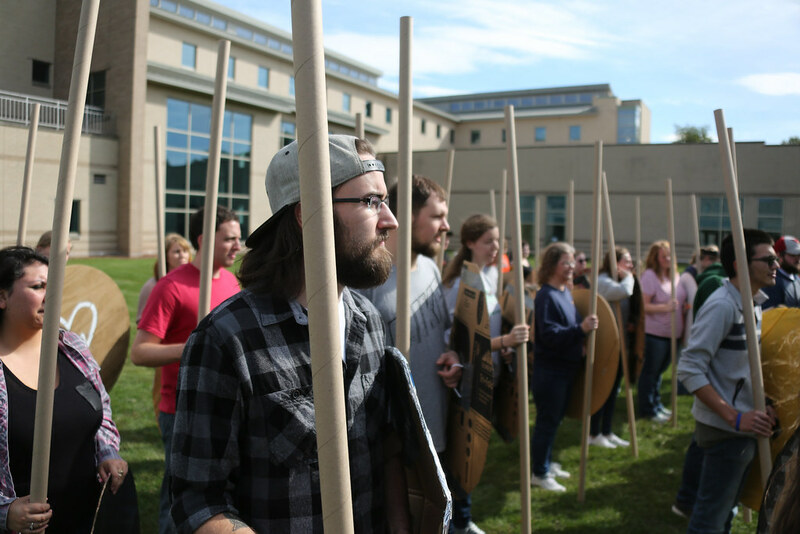 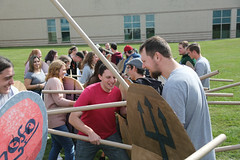 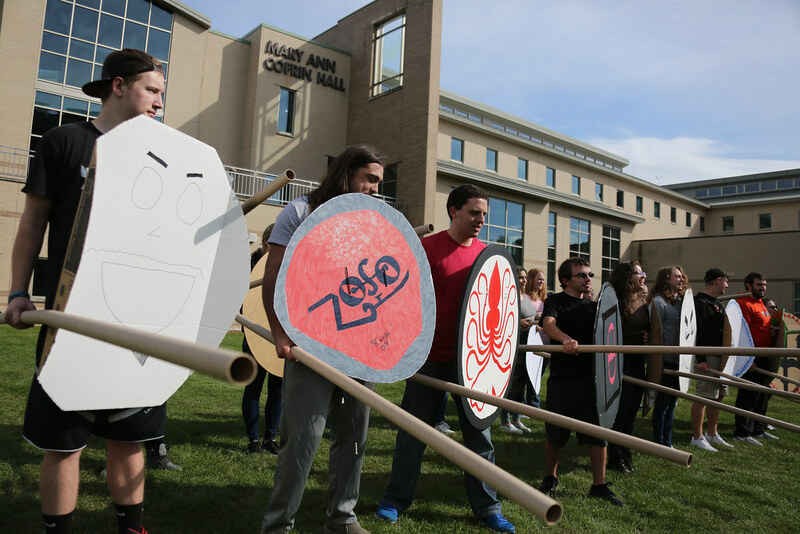 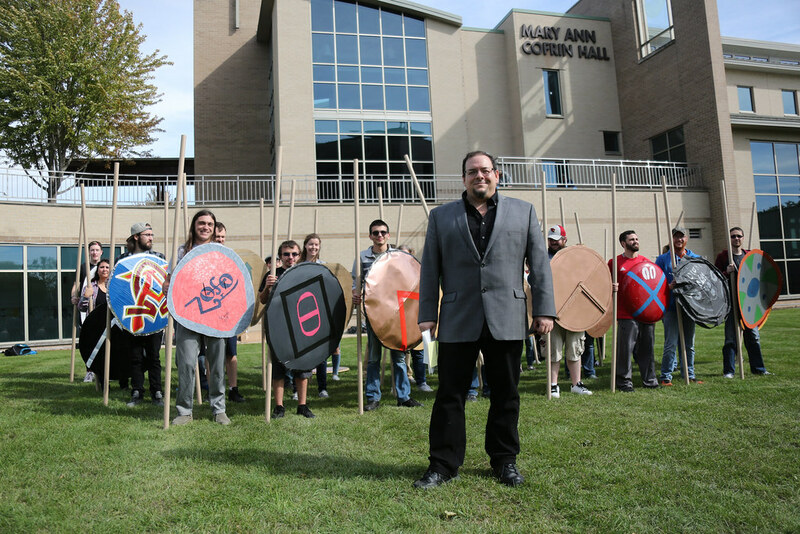 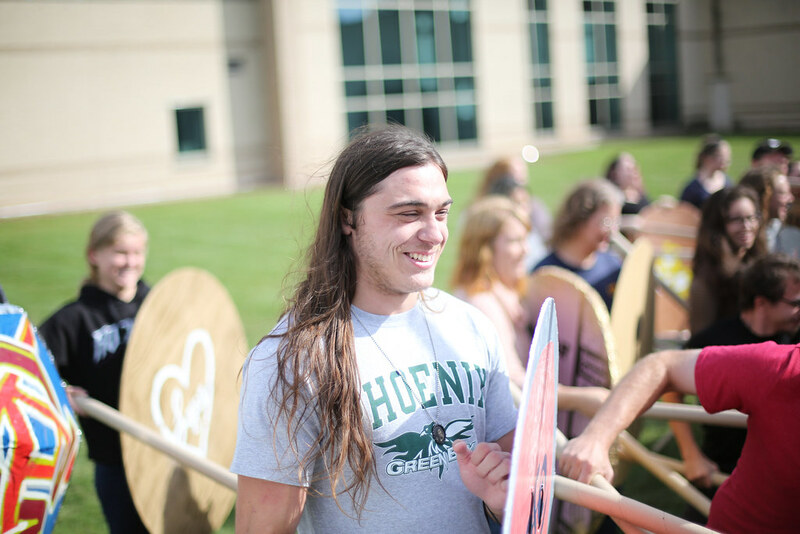 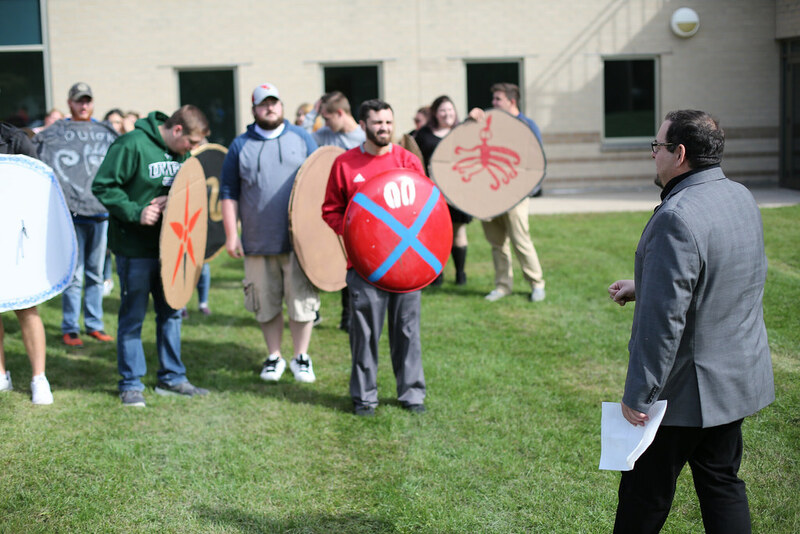 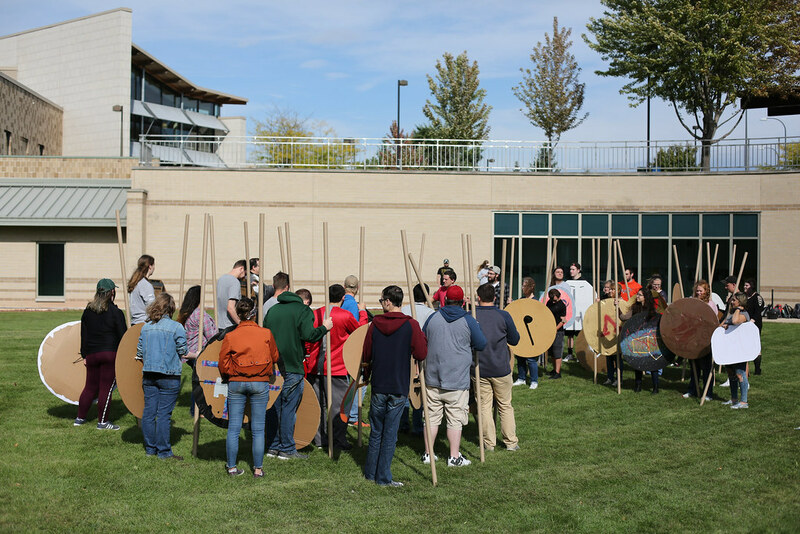 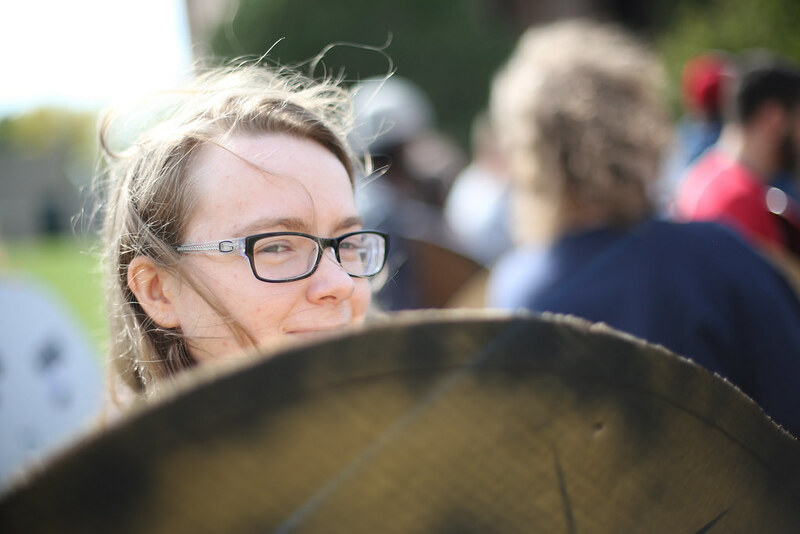 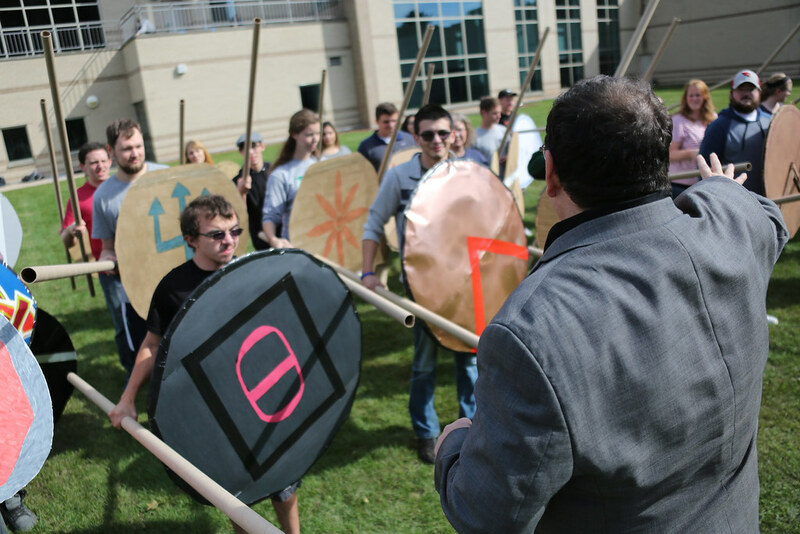 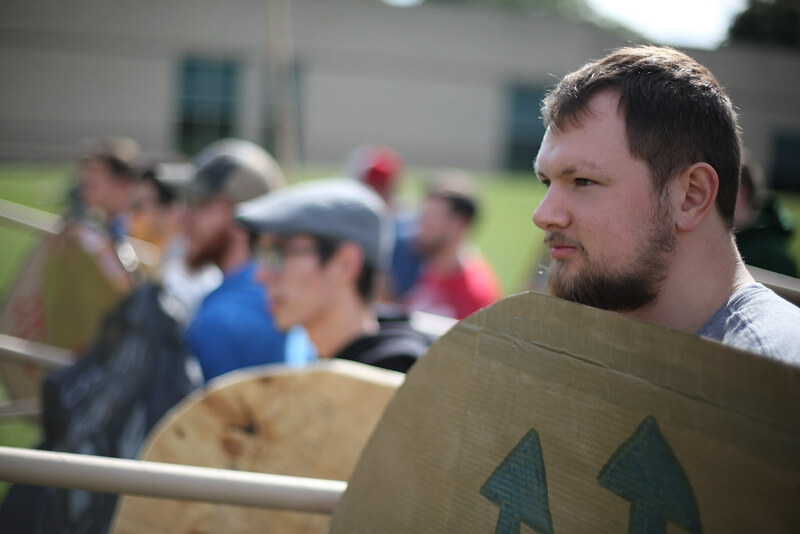 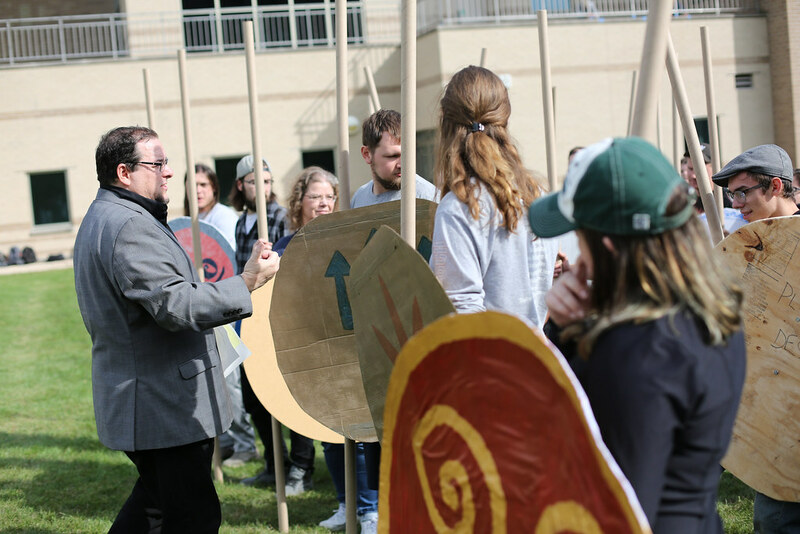 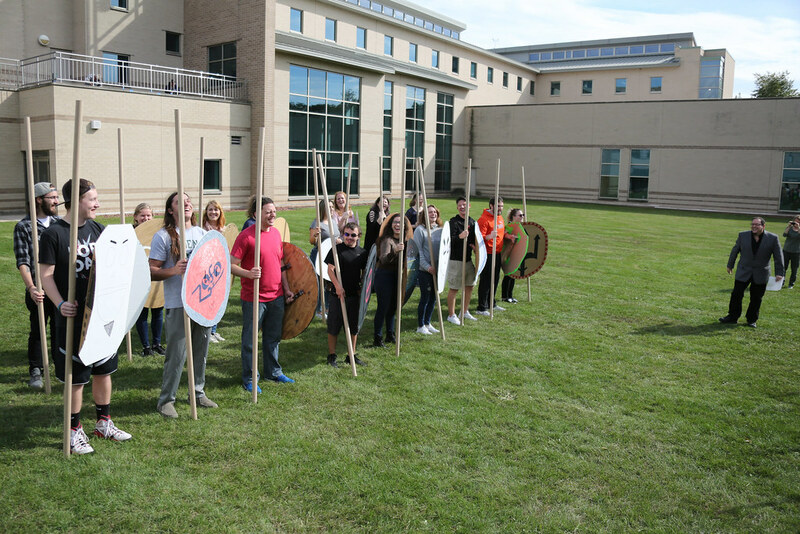 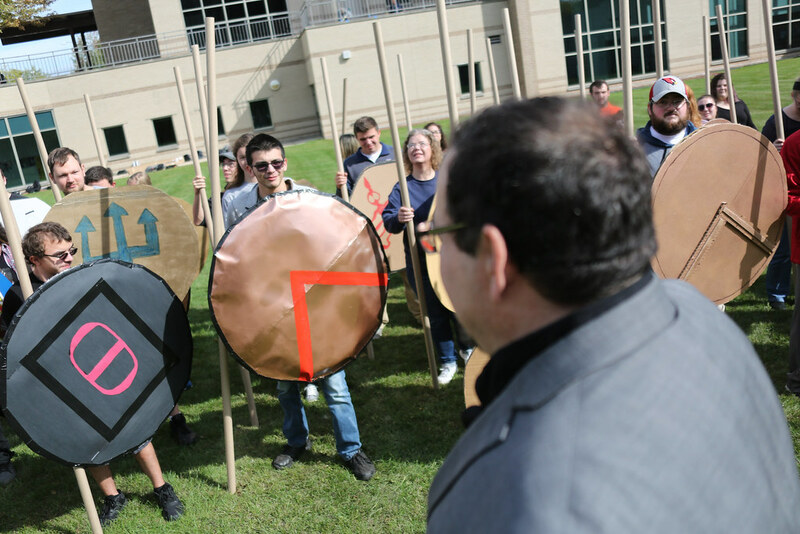 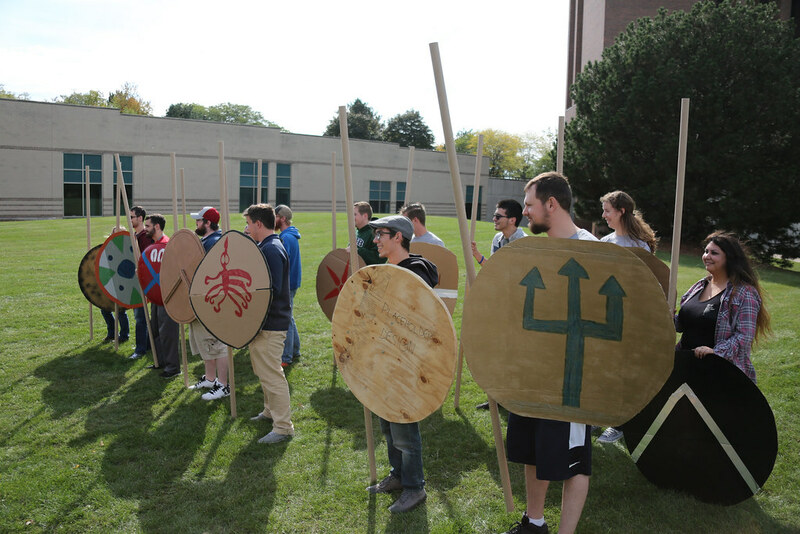 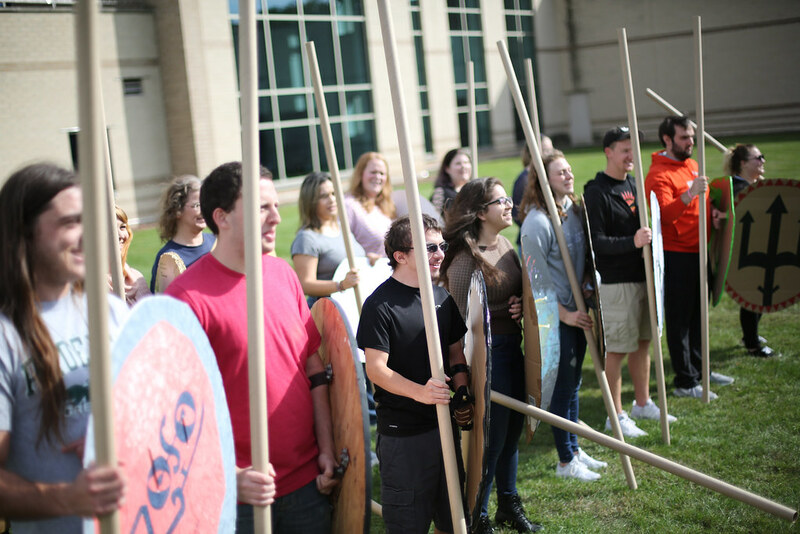 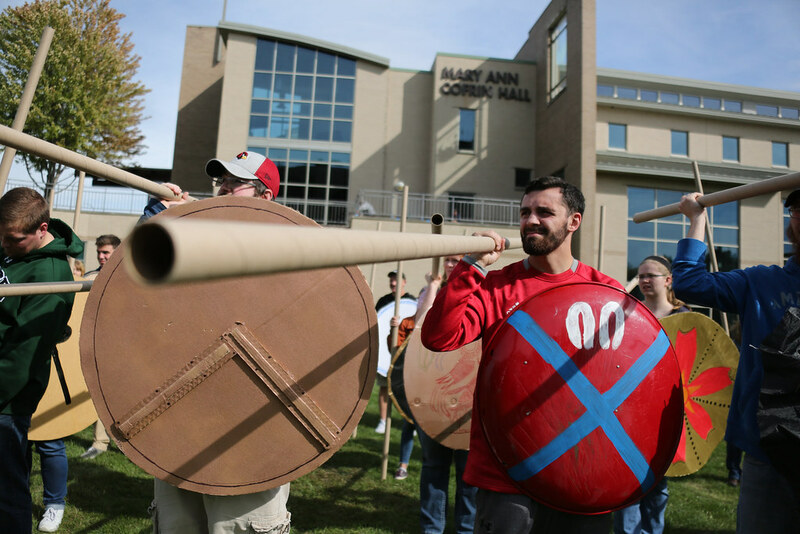 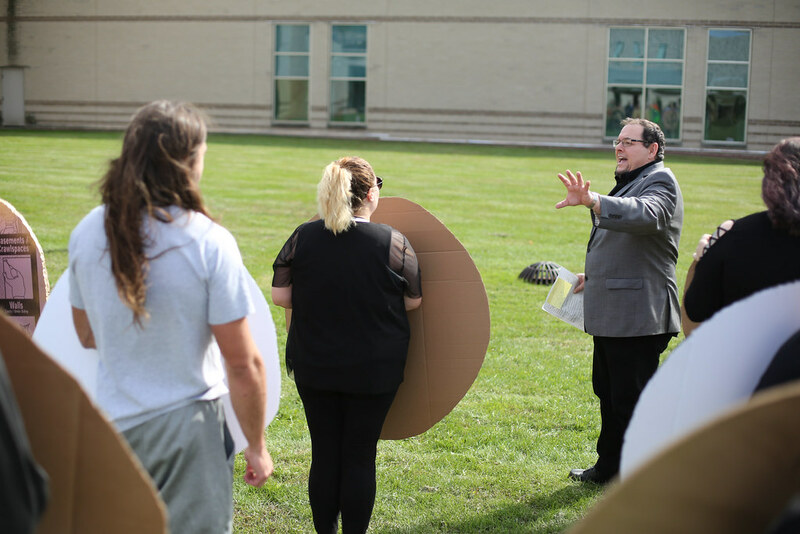 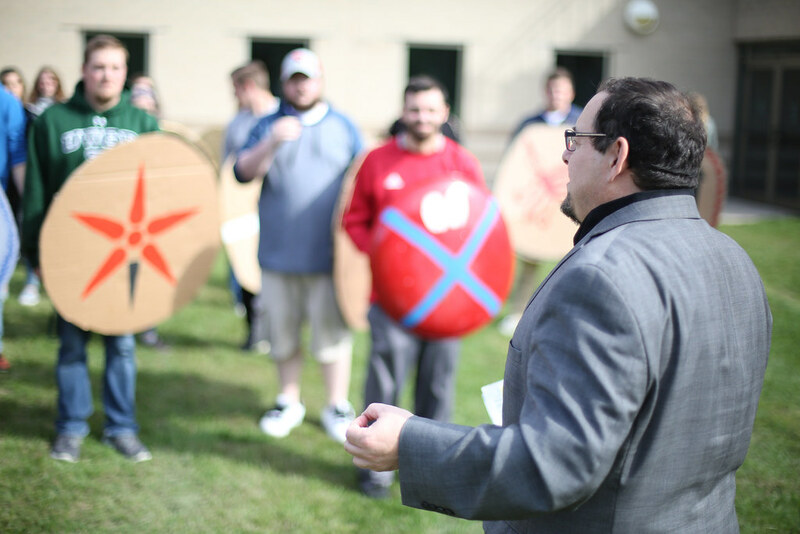 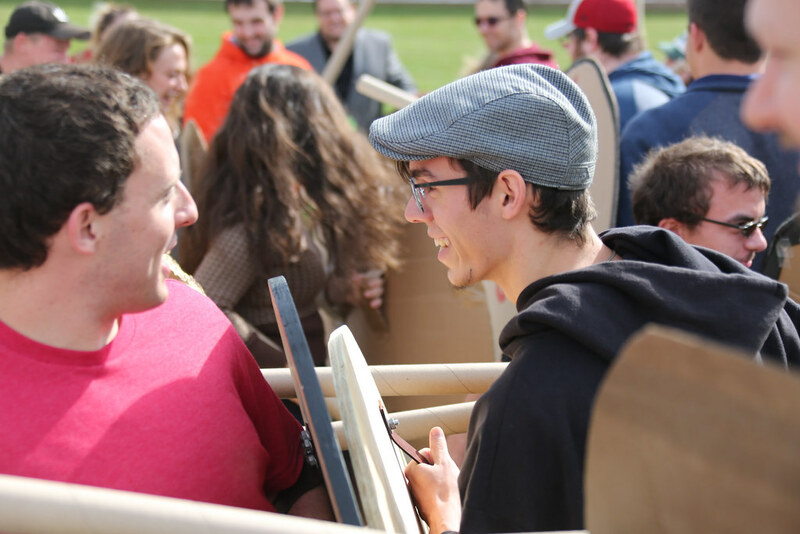 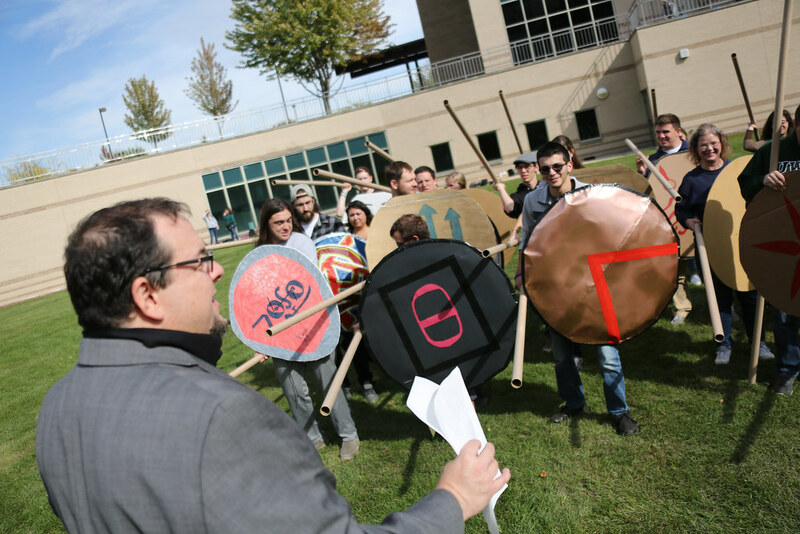 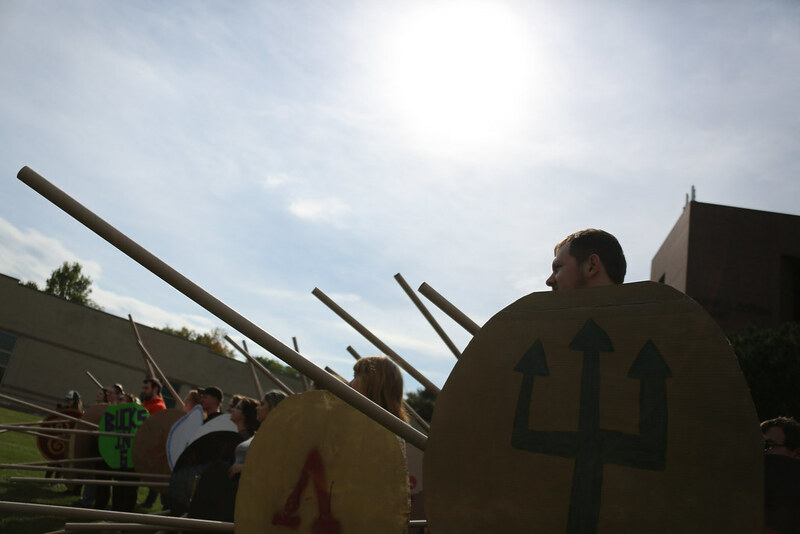 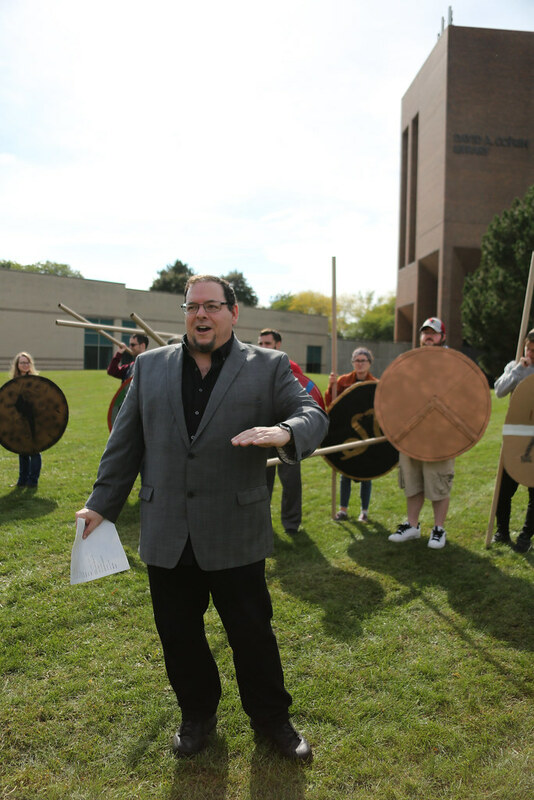 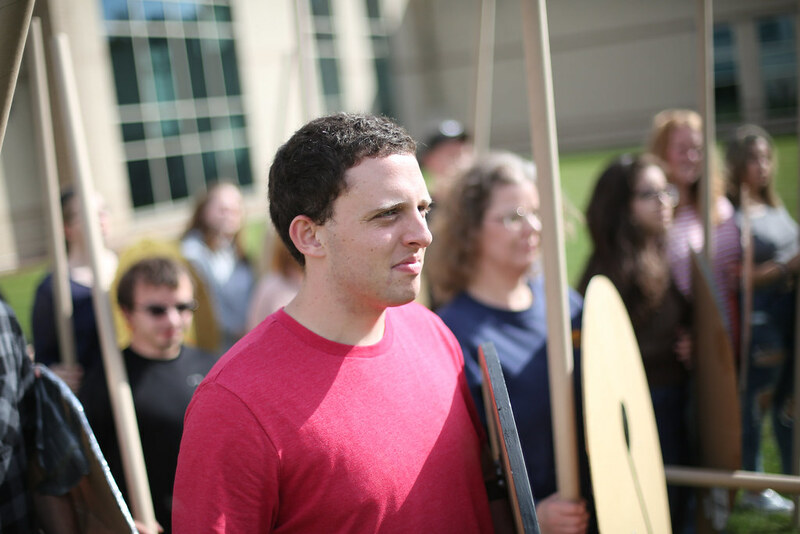 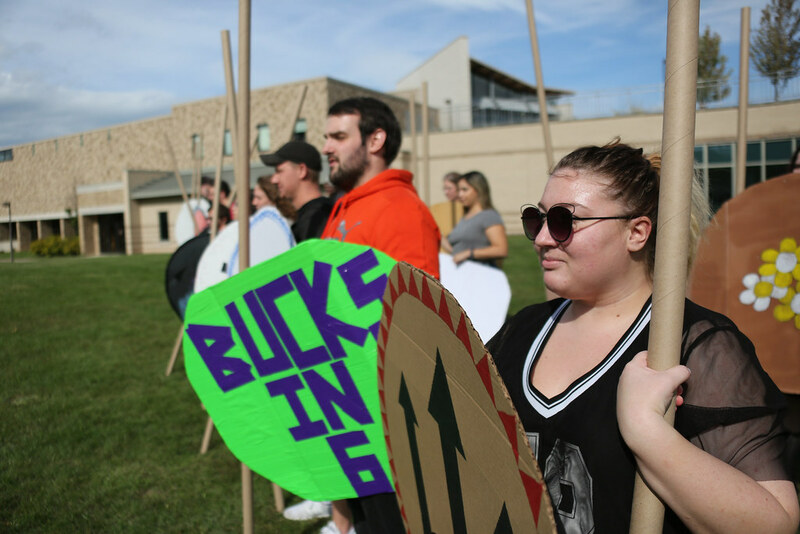 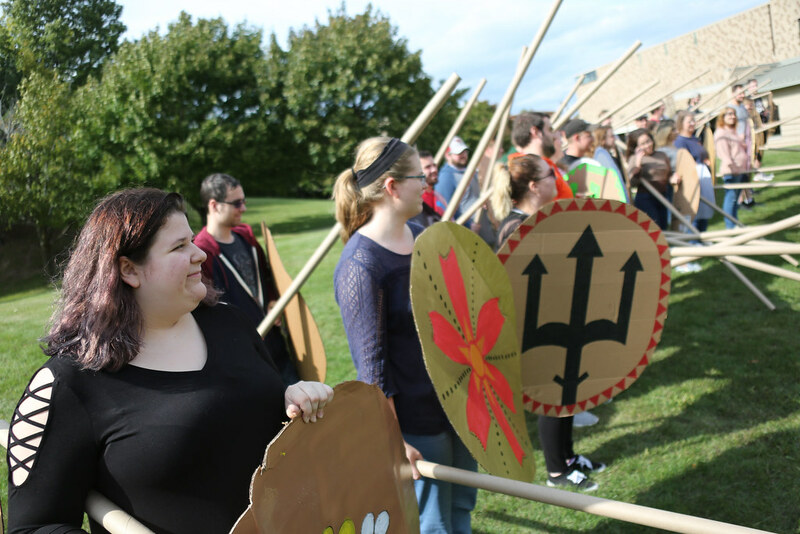 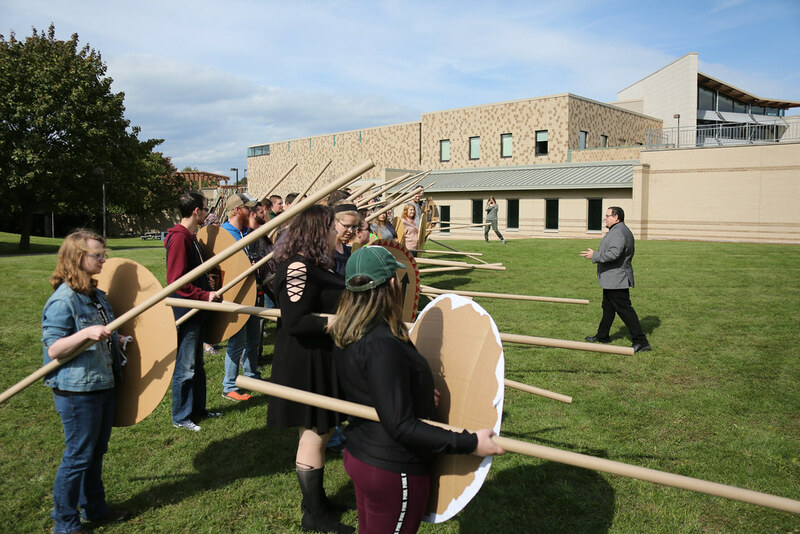 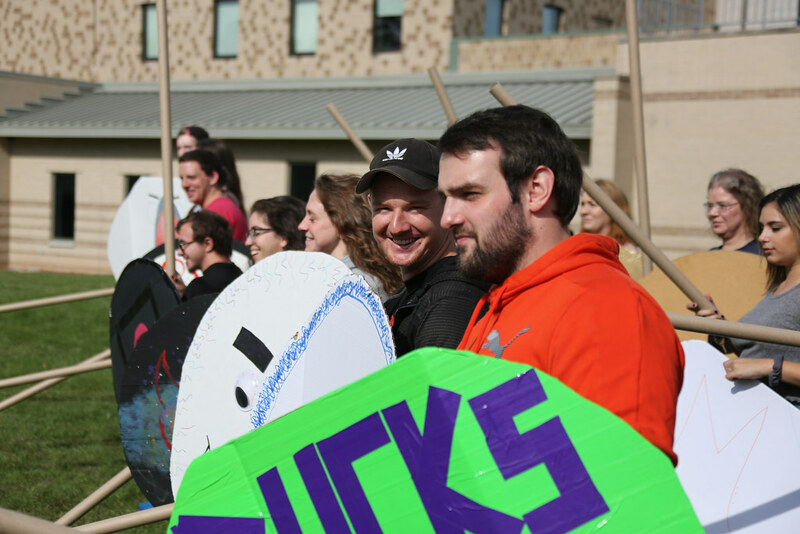 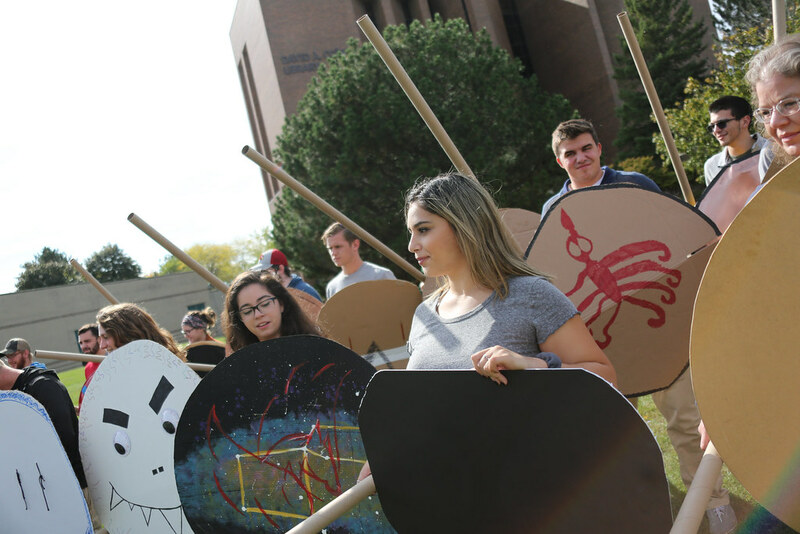 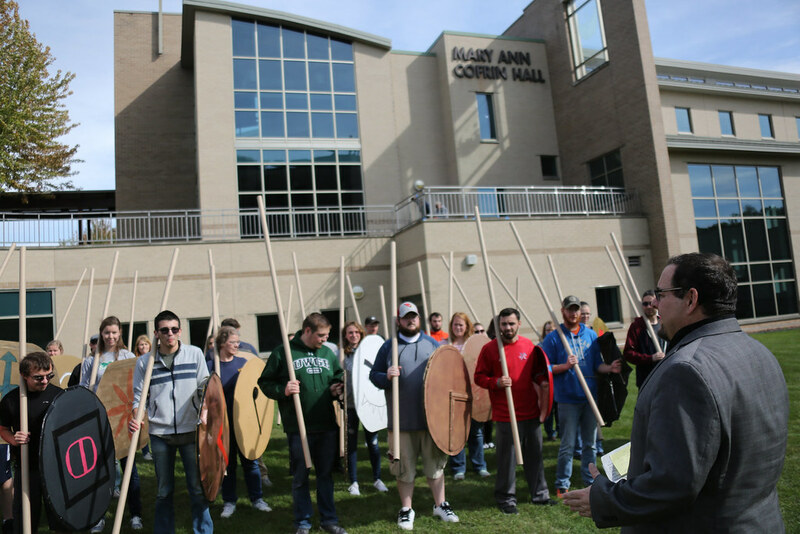 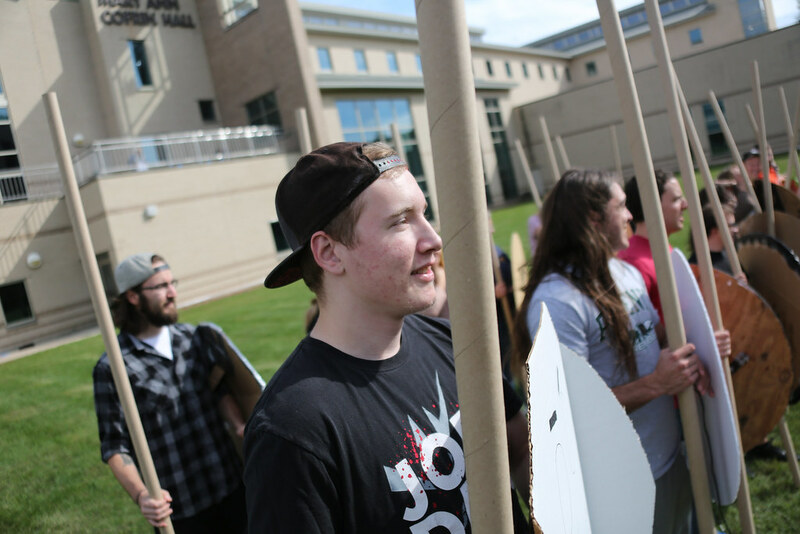 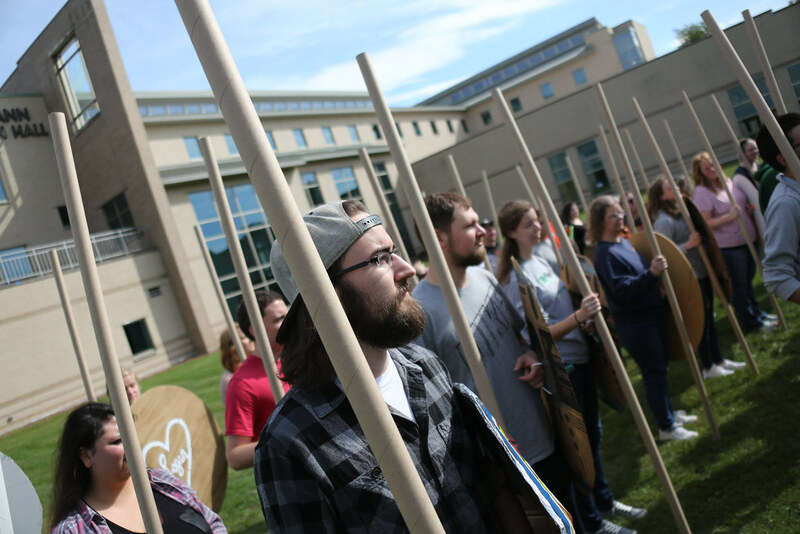 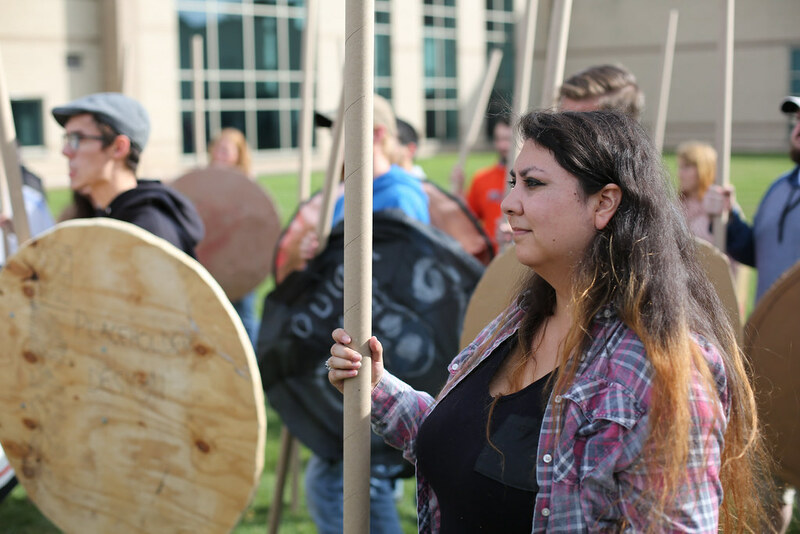 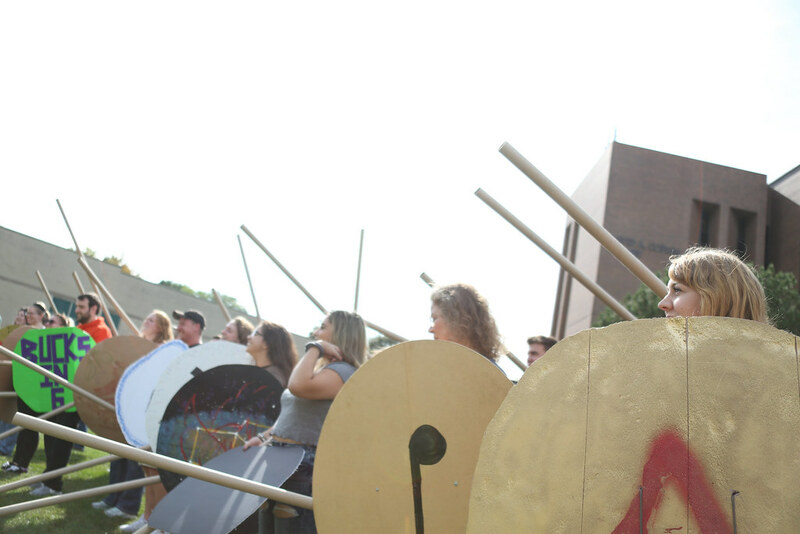 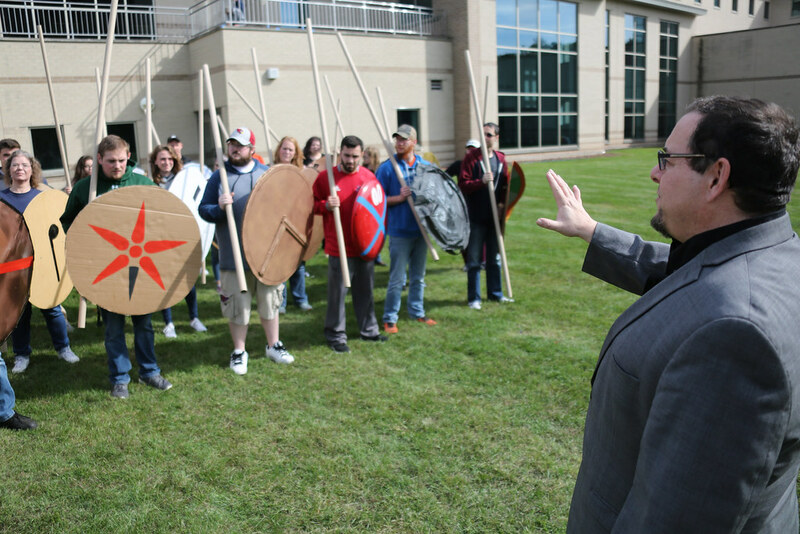 With spears and shields in hand, students in Prof. Greg Aldrete’s History of Ancient Greece class experienced history first-hand by recreating battle formations in the quad, Thursday, Sept. 27, 2018. 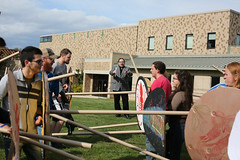 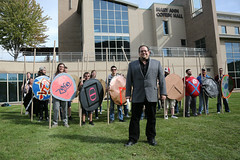 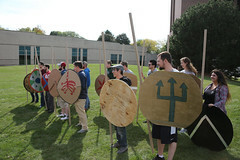 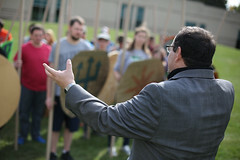 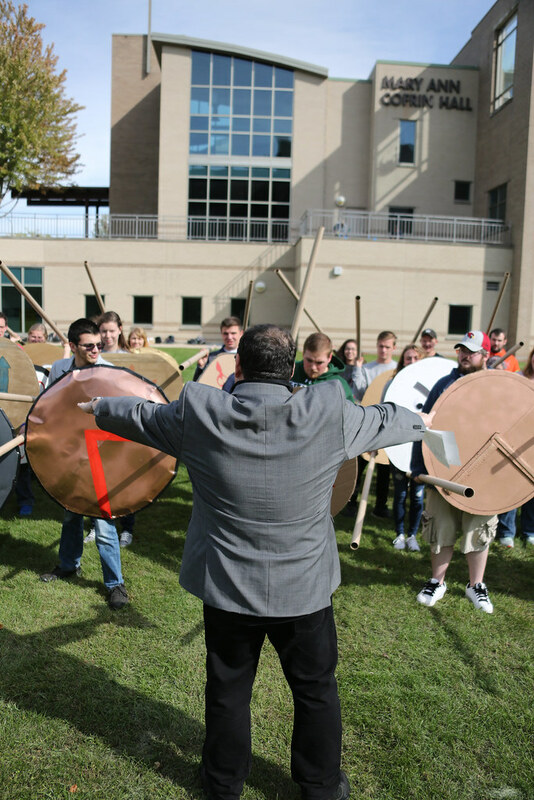 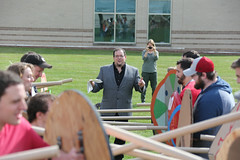 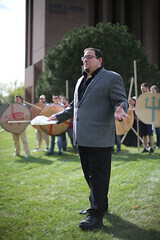 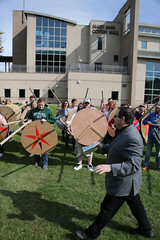 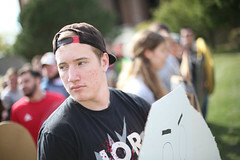 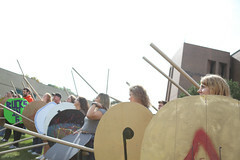 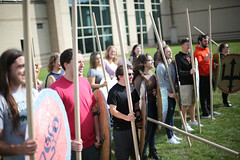 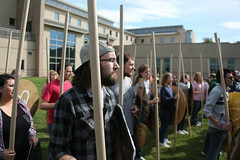 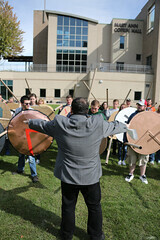 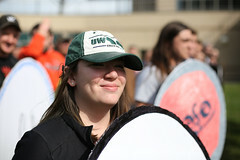 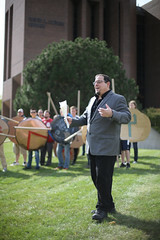 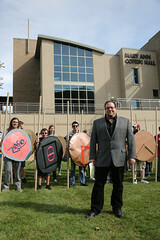 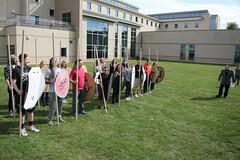 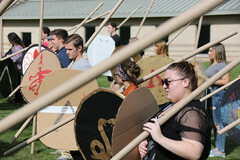 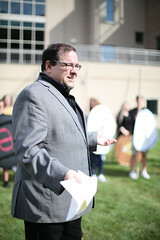 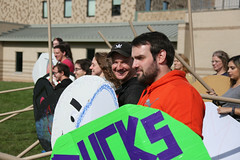 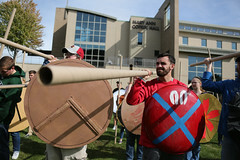 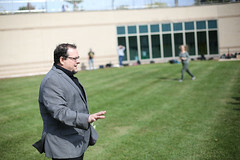 On the day of the “battle” students took took the the campus quad (between the Cofrin Library and Mary Ann Cofrin Hall) to practice the formations, war chants, and techniques used by Ancient Greek Hoplites. Hoplites were citizen-soldiers of Ancient Greek city-states and their primary armor were spears and shields. Hoplite soldiers would of been wearing about 70lbs of armor. The most important aspect of Hoplite warfare was the phalanx formation. 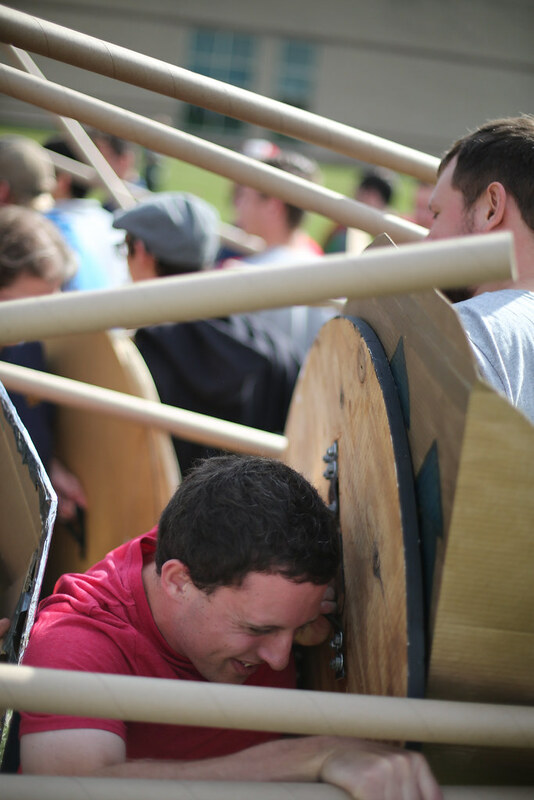 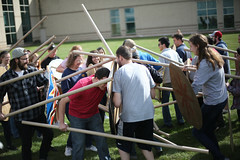 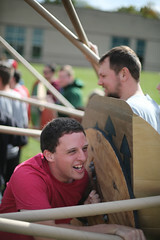 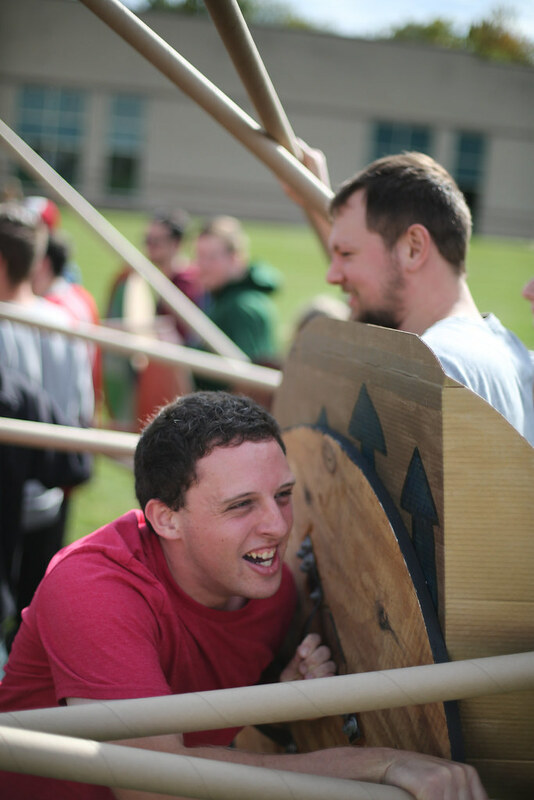 Students learned the importance of coordination and moving as one unit when in the phalanx. 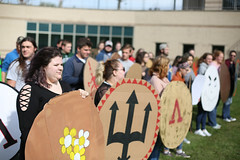 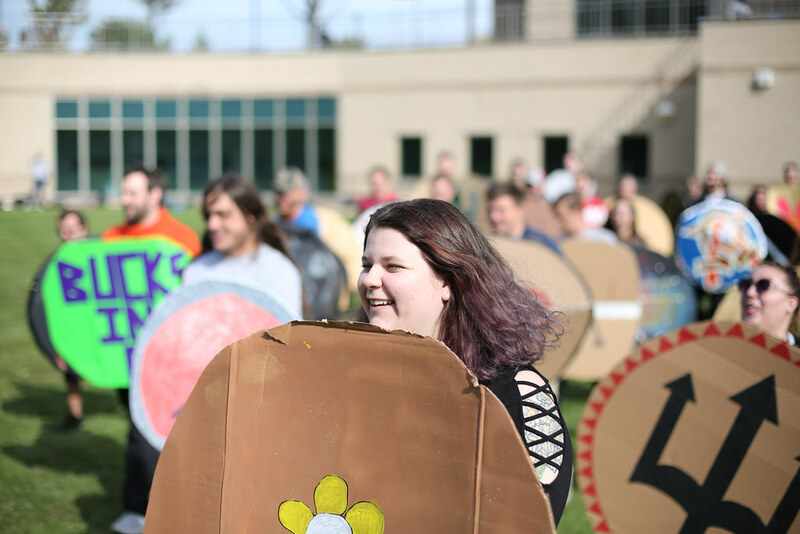 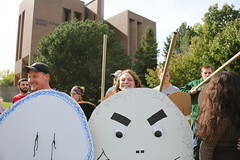 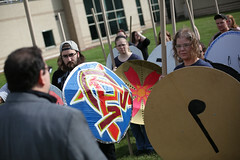 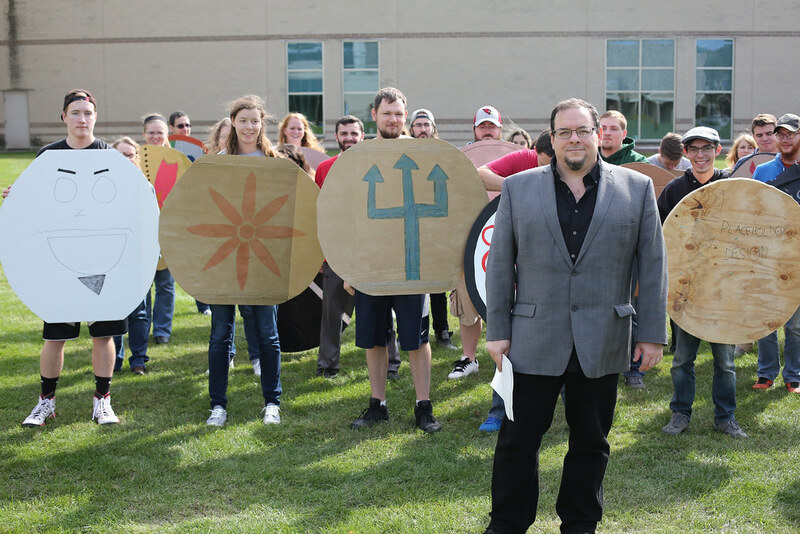 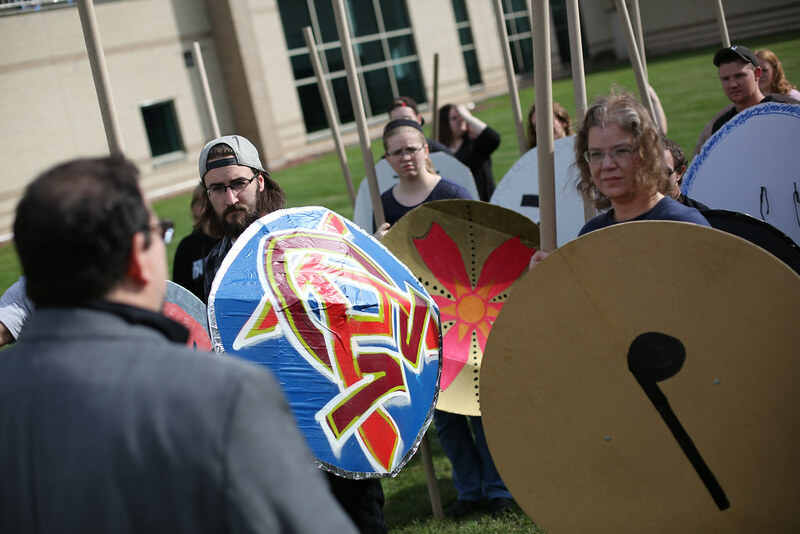 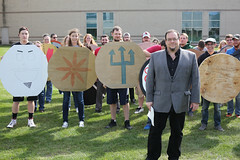 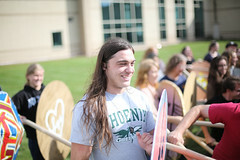 Prior to the event, students were asked to create to create and decorate three-foot round shields in preparation for the class. 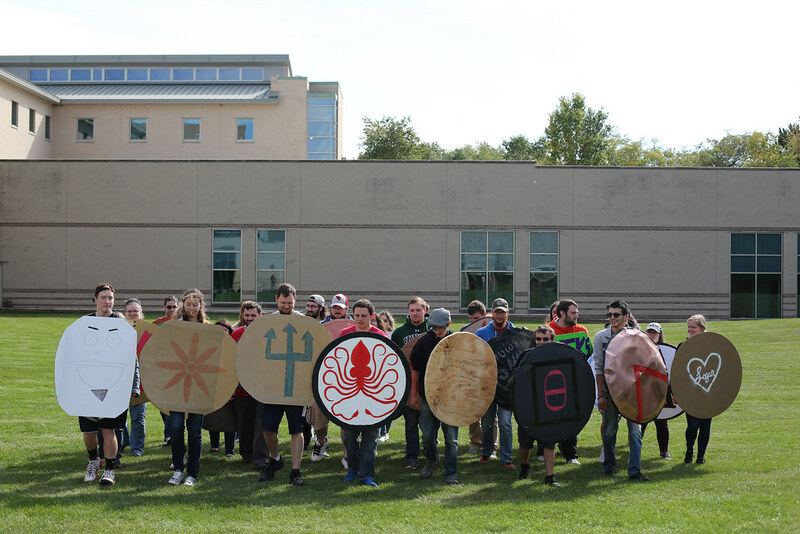 Photos show the variety of different designs on the shields ranging from Ancient Greek symbols to those reflecting the shield-holders personalities including peaceful painted flowers. 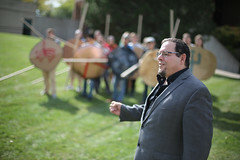 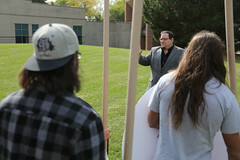 Prof. Aldrete supplied the classroom with imitation spears in order to show students different weapon positions within the formation. Throughout the day, students learned the “at ease” position, a marching position (spear over the shoulder), plus underhand and overhand attack positions. 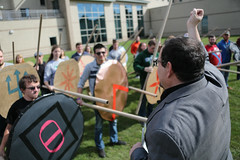 The day ended in a battle between two phalanxes. 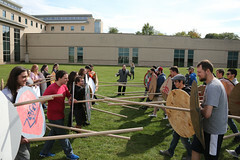 Students shouted battle chants back and forth and utilized different techniques they had learned throughout the class period. 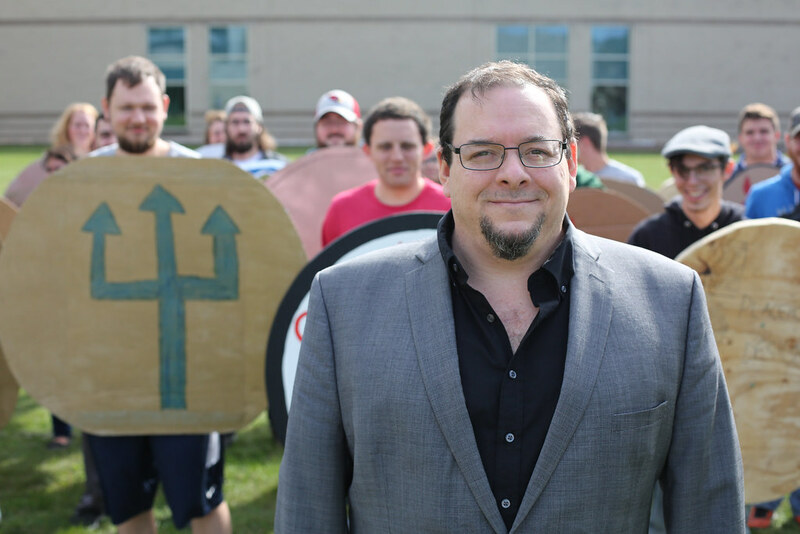 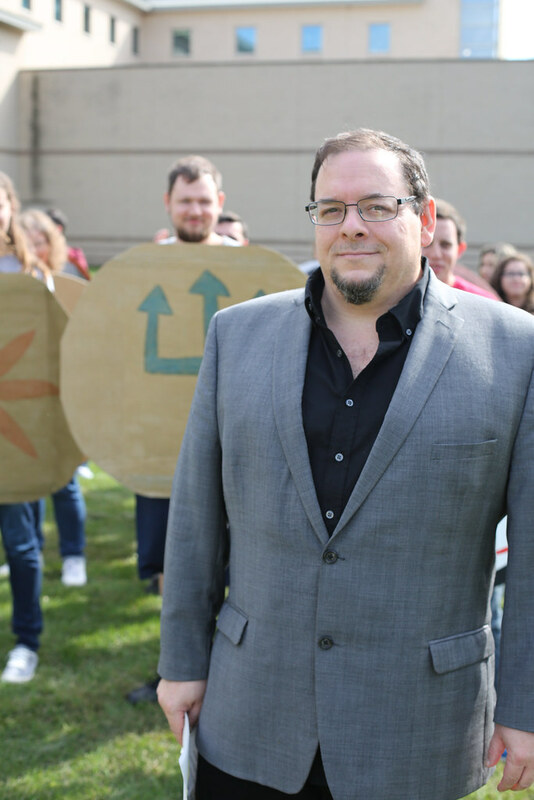 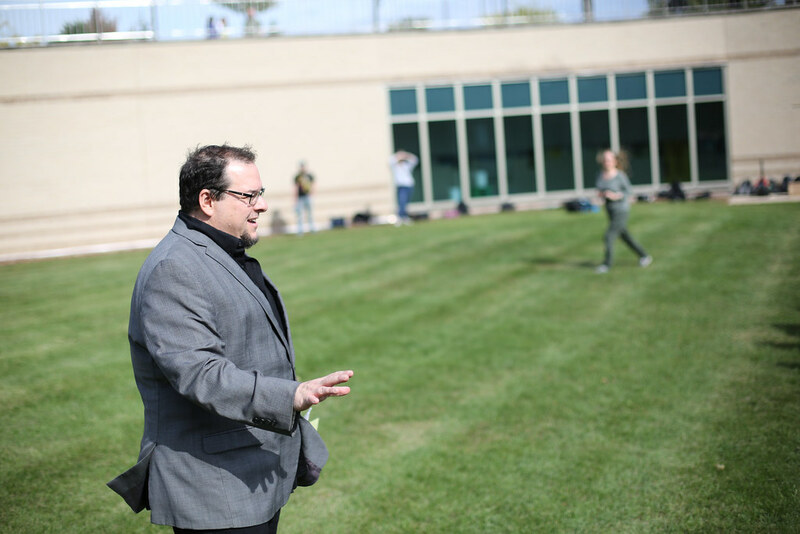 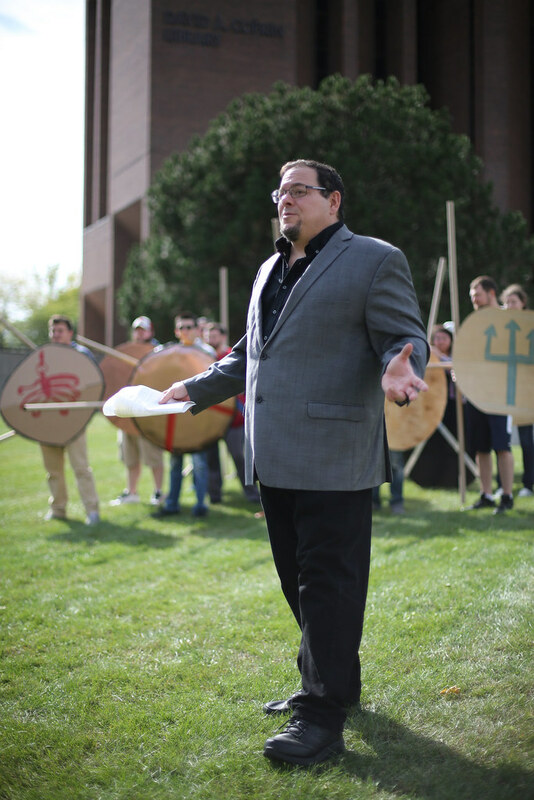 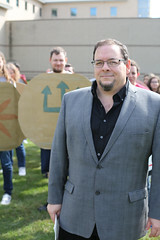 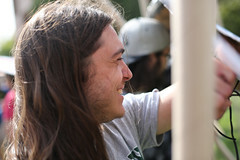 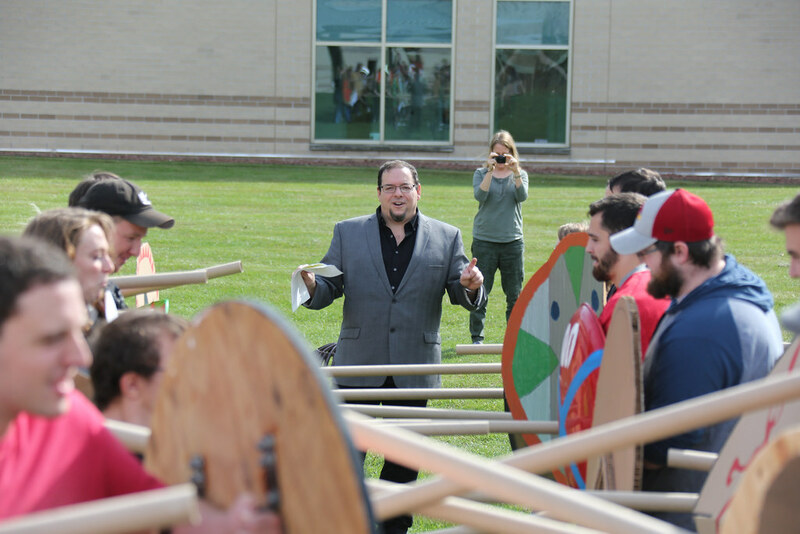 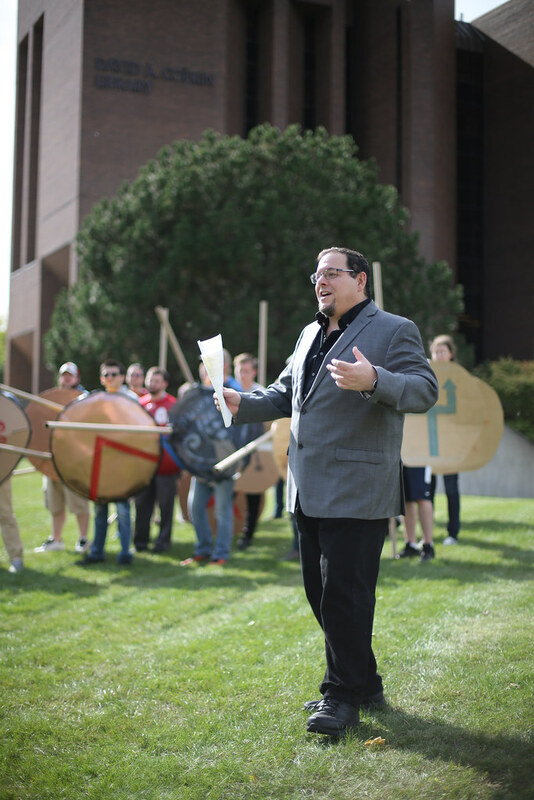 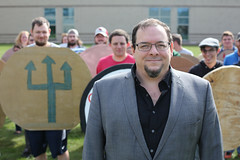 Prof. Aldrete has been leading Hoplite Day and other hands-on learning experiences in order to best teach an understanding of Ancient Greece for the past several years.